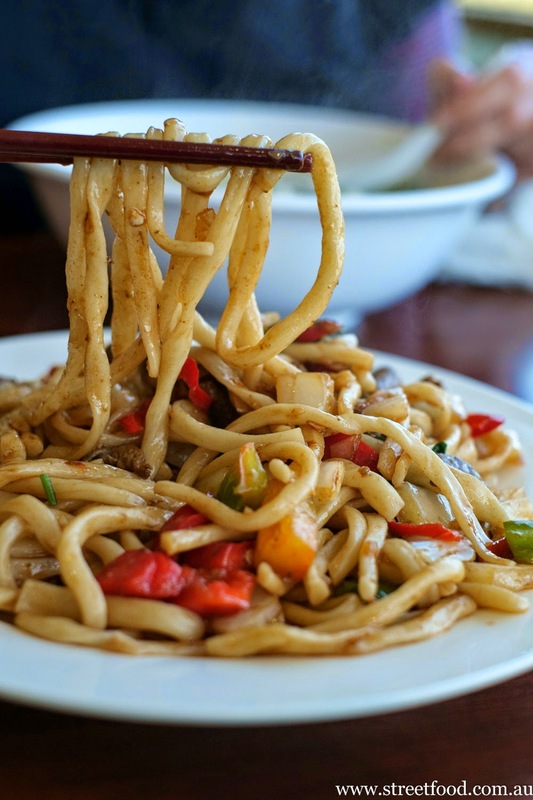 The simply named Handmade Noodle Bar at Carlingford Village offers what they promise and more. We've been getting up to Carlingford whenever the access to wheels allows us to head northwest. 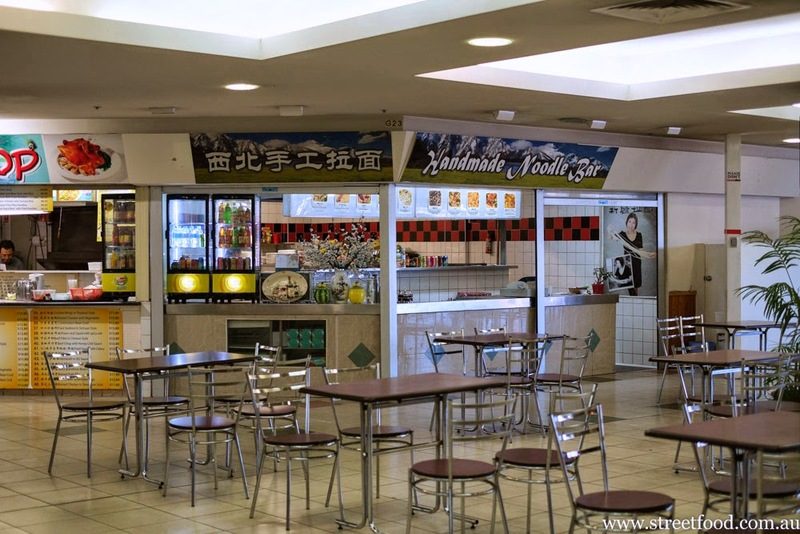 In the simple food court inside Carlingford Village are two noodle bars side by side. 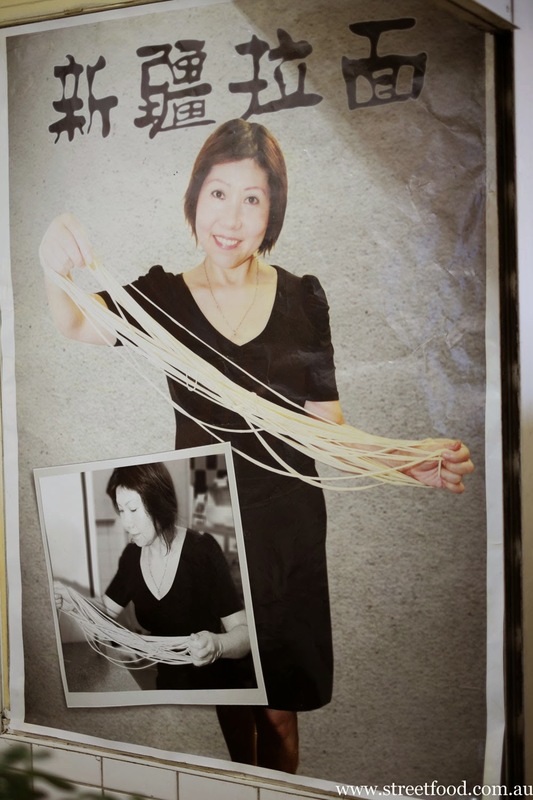 We choose the one with the big portrait of the queen noodle maker herself and she is there in person to make our noodles as well. The choices are few but most include the handmade noodles made on site. Beef Noodle Soup, $8.50. The broth is peppery and there is a little 'crazy tongue' flavour of Szechuan pepper in there too. Slices of roast beef and a big serve of noodles. Adorned simply with cooked cabbage, greens and coriander, this was a big bowl of goodness. Egg and Chive pancake, $4.50. 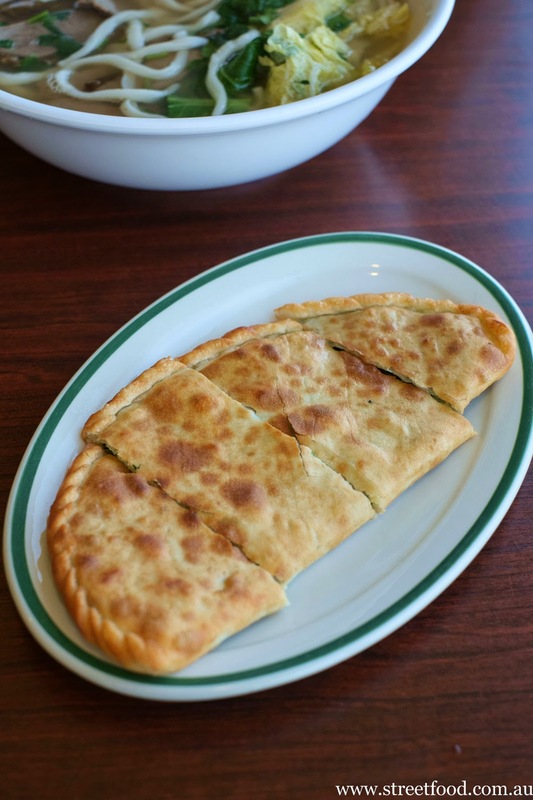 One of the staples of a lot of northern Chinese style cooking, we love the way the dough is folded over and oh-so-neatly folded at the edges. It comes out not too oily with the outside crisp and the insides steaming hot. 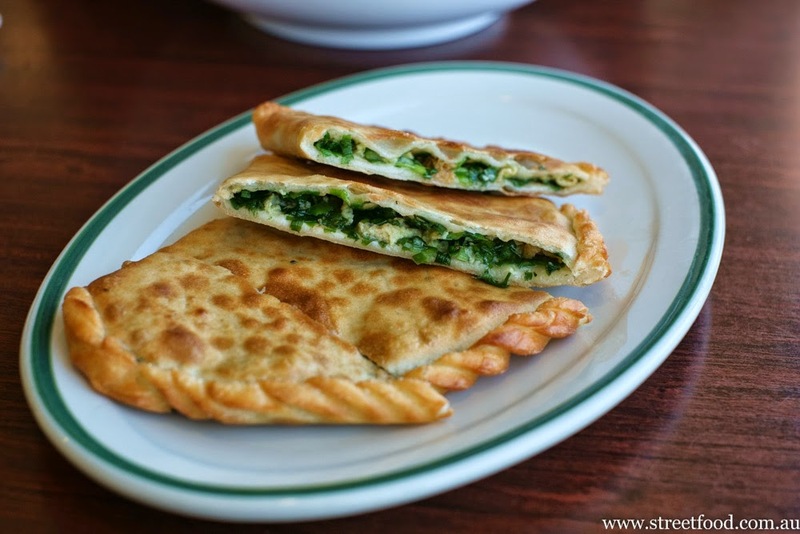 The flavours are fresh from the bright green chive filling, mixed in with a little scrambled egg. Dip it into a little of the chilli sauce available on the stall counter top. 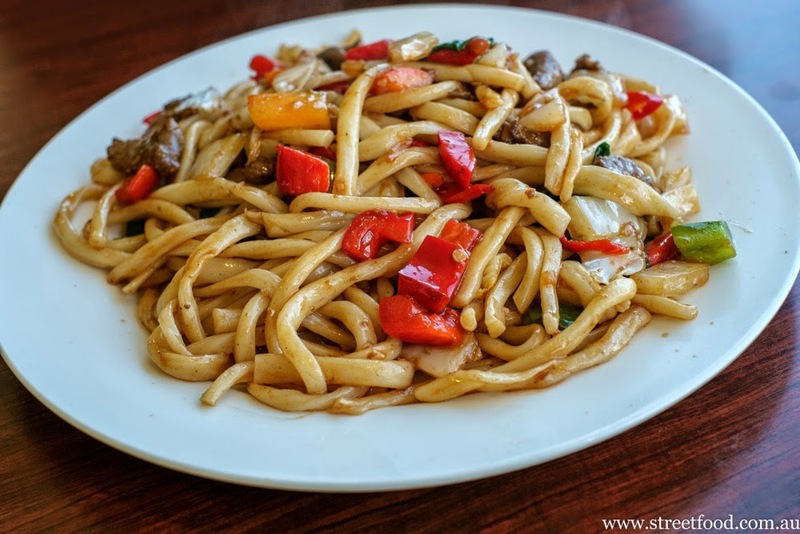 Spicy stir fried handmade noodles with lamb $9.00. This style of dish shows off the makers skill in noodle creation. Some of the strands have uneven bits, they are mismatched and have a great bite to them. The noodles are coated with a spicy/sweet sauce and a scattering of cooked chopped capsicum and a few small bits of lamb are found lurking underneath the pile. 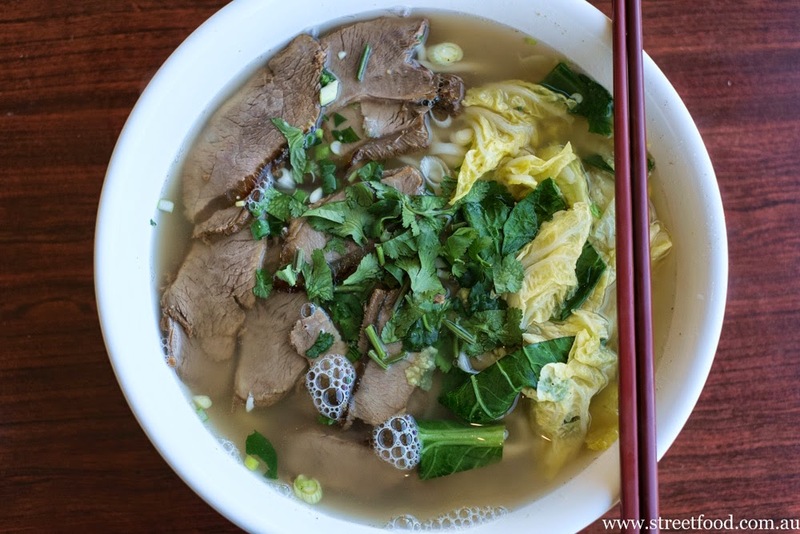 Handmade Noodle Bar is at 372 Pennant Hills Road, just near the intersection with Marsden Road. That pancake looks awesome and I love the chewiness of fried handmade noodles!